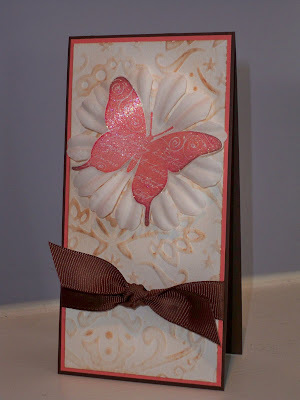 Trinity Designs: Butterflies are in the Air! Ta Daa! Yep, I finished the swap cards AND managed to get them all in the mail before the post office closed yesterday! WooHoo! Now I can just sit back and check my mailbox for all the great return swaps that are coming my way - I love to swap! This card really came together fast, I'm not always that lucky, but I knew I wanted to use the new Texturz plates for my Big Shot and the butterfly image from the Simple Friendship stamp set is one of my favorite new images this season. It just has endless possibilities. I created the textured background by cutting my Whisper White cardstock and placing it on the Texturz plate, spritzing it with a little alcohol - yes, rubbing alcohol - you guys know I don't drink! LOL! The moisture allows the paper to emboss quite deeply and gives the texture a great feel. Using alcohol instead of water is great because it evaporates so quickly. Anyway, once it was embossed then I used my Creamy Caramel ink and Stampin' Sponge to rub the color all over the cardstock. Not evenly, but light in some places, dark in others. I really wanted it to look weathered. Once I finished sponging, I layered it on a piece of Cameo Coral cardstock and tied a piece of Chocolate Chip Wide Grosgrain ribbon in a knot around it. This was then layered on my Chocolate Chip card base which was cut at 3" x 12"and folded in half vertically. There is a 1/8" variance in each layer from the base for this card. On to my sparkly butterfly! These turned out so much better than I'd planned - I just wish the photo really gave it justice! I used the Rock and Roll technique for this one, stamping first in Cameo Coral ink, then rolling it in Rose Red, then finally just tipping it in Close to Cocoa. Each butterfly was cut out with Paper Snips then I covered the whole piece with Versamark ink. A little sprinkle of Iridescent Ice EP and heating with my Heat Tool - Voila! Sparkly Butterfly! To create the curved wings, I simply used the edge of my Bone Folder and curled the wings just like you would curl ribbon between your thumb and a scissors. But gently though - one of my butterflies lost a wing tip! Oops! A little Crystal Effects glued it back though - yes, you can fix most anything! The final touch was just using Mini Glue Dots on the butterfly body and attaching it to the large silk flower from the Pretties Kit. I left it au natural so it would stand out from the background a bit. The flower was then attached to the card front with more glue dots. It's a pretty simple card, really, but I don't want to cut out 16 butterflies again for a while! LOL! Let me know what you think - I love to hear from you! Your comments make me smile! very pretty! love the design and color combo. and sparkles on the butterfly! Absolutely Gorgeous! I would never have though of sponging the color of the embossed paper! Very Clever! I love the butterfly! This is stunning! I love it Robin! Very Pretty. 16 butterflies? try cutting 150 butterflies, for your first swap at convention. I never wanted to use that stamp set again. Your card is very elegant. I knew about the alcohol with the texturz plates, haven't tried it yet. Thanks for sharing. Stunning! Don't you just love those "simple" cards?!! They are never quite as simple as they appear, are they?! !